Alicia’s research addresses animal’s behavioral and physiological responses to environmental change and anthropogenic disturbances. In particular, her PhD research examines the impacts of human-produced noise on mate choice in adult tree swallows and methylation patterns in nestlings. Prior to joining the Graduate Group in Ecology at UC Davis, Alicia completed her master’s thesis at San Francisco State University in 2016. Her MS research examined the salamander microbiomes in various Ensatina eschscholtzii subspecies and sympatric Batrachoseps species with professors Andy Zink and Vance Vredenburg. Mary’s research interests lie at the intersection of animal behavior and ecology, especially where human-induced changes to the environment have altered how organisms interact with their habitat and each other. 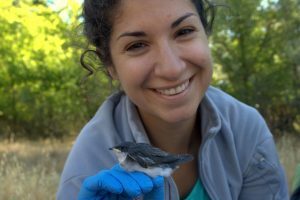 Her dissertation research addresses how birds and bats around high-elevation lakes in the Sierra Nevada mountains use insects as a food resource during the summer breeding season, and how the introduction of non-native trout to those lakes may have altered the dynamics of that food resource. To do so, she is using both long-term audio recordings and traditional observations to address differences in bird and bat activity at lakes with and without trout. A large part of her work is investigating the utility of acoustic recordings in ecological research and management. Mary’s research was funded in part by an NSF Graduate Research Fellowship. Prior to joining the Graduate Group in Ecology at UC Davis, Mary received her Bachelor’s degree in Biology and English at St. Mary’s College of Maryland in 2009. She has worked as a seasonal field biologist on a variety of wildlife management and monitoring projects in Yosemite, Sequoia, and Kings Canyon National Parks, and for Point Blue Conservation Science, and continues to work in collaboration with the National Park Service. Mary is also interested in the power of natural history, science writing, and outreach to connect the wider community to science. She is a co-founder and curriculum writer for the UC-Davis chapter of GOALS (Girls’ Outdoor Adventure in Leadership and Science). Buxton, R.T., McKenna, M.F., Clapp, M., Meyer, E., Stabenau, E., Angeloni, L.M., Crooks, K., Wittemyer, G. 2018. Efficacy of extracting indices from large-scale acoustic recordings to monitor biodiversity. Conservation Biology 32(5): 1174-1184. Price, J.J., Clapp, M.K., and Omland, K.E. 2011. Where have all the trees gone? The declining use of phylogenies in animal behaviour journals. Animal Behaviour 81(3):667-670. Sarah is a PhD Candidate in the Graduate Group in Ecology. Her research interests encompass animal communication, ornithology, breeding biology, and sensory ecology. Sarah is passionate about understanding how organisms use their sensory systems to obtain and transfer information, especially in the context of mate choice and individual recognition. She is particularly interested in the more cryptic and often overlooked chemical senses in birds. Sarah’s dissertation is focused on a small, long-lived, monogamous seabird species called the Leach’s storm-petrel (Oceanodroma leucorhoa). Her research explores how this highly olfactory and very stinky bird uses its incredible sense of smell to obtain information at the breeding colony. She uses a combination of behavioral, analytical, and molecular techniques to discern what kinds of information are advertised in the body odor of this species and how individuals use this information for important reproductive behaviors, such as recognizing both their mate and their underground nest. Prior to coming to UC Davis, Sarah graduated with a Bachelor’s degree in Biology and Environmental Studies from Whitman College in Walla Walla, WA. She spent several years studying seabird bycatch in global fisheries at the University of Washington. She has also worked for USFWS surveying seabirds in the Bering Sea, as a technician in a limnology lab, and as an environmental educator. Jennings S, Nevitt GA, Ebeler SE. In Prep. Individual-specific odor signature in Leach’s storm-petrels (Oceanodroma leucorhoa). Ryane received her bachelor’s degree at the University of Rochester in upstate New York, where she conducted research under Dr. Richard Glor. While working with Dr. Glor, she examined the differences in behavioral displays of Anolis distichus subspecies in a hybrid zone, as well as asked questions about the ontogeny of these displays. Ryane also conducted a summer internship at the University of Maryland, working with Dr. Jerry Wilkinson and Gerald Carter, where she helped with research examining the individuality of vampire bat social calls. 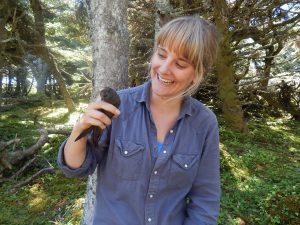 The first year of her PhD studies was spent with Dr. Andrea Townsend looking at cognitive tradeoffs and migration in American crows (Corvus brachyrhynchos). Now she is a PhD candidate through the Animal Behavior Graduate Group in the Patricelli Lab. 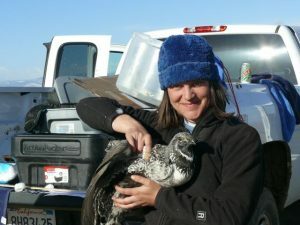 She is conducting research on the Greater sage-grouse in Wyoming. 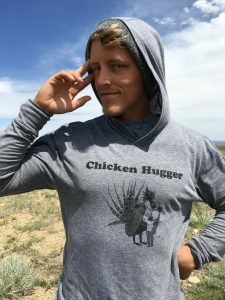 Ryane’s research interests in the sage-grouse focus on the choices made by each party during courtship negotiations on the lek, as well as the off-lek behaviors that influence these choices. Ryane’s research was funded in part by an NSF Graduate Research Fellowship. Carly is broadly interested in the effects of anthropogenic noise disturbance on avian social behavior and sexual selection. 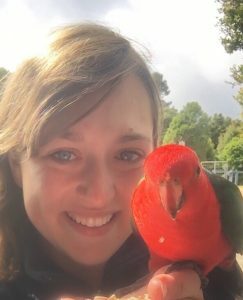 Before joining the Animal Behavior Graduate Group at UC Davis, Carly recently completed her Master’s degree in Biology at The College of William & Mary, where she investigated social responses to traffic noise in free-living red-backed fairywrens (Malurus melanocephalus) and in captive zebra finches (Taeniopygia guttata). Prior to her graduate work, she graduated from Penn State University with a B.S. in Biology (concentration in Ecology) and a minor in Wildlife & Fisheries Science. Hawkins, C.E. & Swaddle, J.P. (In prep) Traffic noise alters individual sociality, but not space-use, in red-backed fairywrens (Malurus melanocephalus). Hawkins, C.E., Pantel, J.H., Palia, S.T., Folks, C.C., Swaddle, J.P. (In prep) Traffic noise alters social networks in captive zebra finches (Taeniopygia guttata): implications for urban songbirds. 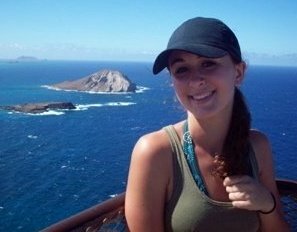 Maria’s previous research experience at the University of Florida, where she graduated with honors in Biology, has ranged from investigating ant-plant mutualisms, coral reefs, to birds. After graduation in 2015, she spent two years living abroad in Asia, Argentina, and Australia, while expanding her skill set in avian field techniques. Drawing from her experience in avian behavior, communication, and conservation, Maria joined the Graduate Group in Ecology seeking to understand how survival mechanisms (i.e. anti-predator behavior, interspecific, and intraspecific communication) in forest bird species are mediated by habitat disturbance. In other words, how do avian communities mitigate the effects of forest disturbance to survive? 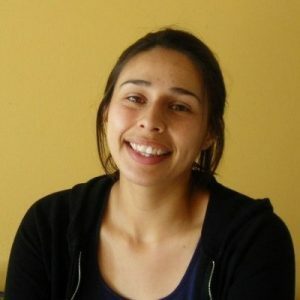 Maria’s interest in community ecology has connections to her experience as an immigrant from Colombia: community support here in the United States helped ease her integration process. Having also worked as a community organizer and digital influencer for the immigrant community in Florida, one of Maria’s central goals is to be a catalyst for marginalized people to learn about the scientific process and potentially pursue a career in STEM. Eric joined the Patricelli Lab in Fall, 2016. He is a PhD student in the Graduate Group in Ecology. His research interests include behavior, conservation, and sensory ecology. He will be working with the Greater sage-grouse (Centrocercus urophasianus) in Wyoming and Bishop, California in order to answer questions about how individuals forage off-leks and how this may affect lek social structure. He is also interested in social structure of leks and how the social landscape is affected by personalities of individuals and physical structures. Eric is also working on a project with turkey vultures (Cathartes aura) and researching how multimodal behaviors may allow for greater plasticity in the face of human induced rapid environmental change. Unsurprisingly, Eric is motivated by finding ways to inform conservation efforts with behavioral research. Before coming to UC Davis, Eric worked as a seasonal technician and research assistant in various bird-related labs at UC Berkeley and UC Santa Cruz. He also worked as an education program manager for wildlife related nonprofits. Before that, Eric graduated from UC Berkeley with a BS in Molecular Environmental Biology: Animal Health and Behavior. Aside from research, Eric is passionate about natural history, bird-watching, fly-fishing, fitness, and engaging people in science and conservation. In particular, Eric strives to allow underrepresented groups find paths in and to science. As such, Eric is the co-chair of the Education and Outreach committee for the UC Davis chapter of the Society for Conservation Biology. On weekends it is not uncommon to find Eric chest-high in Putah creek chasing down trout and listening to birds. Or watching Netflix. Really a 50/50 there. Jessica completed her dissertation in 2012 in the Patricelli Lab through the Graduate Group in Ecology. 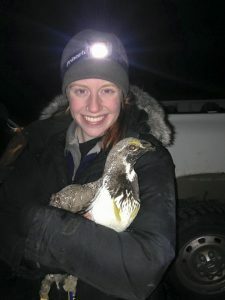 Jessica’s dissertation research in the Patricelli Lab investigated the impacts of noise pollution on greater sage-grouse; you can read more about her work here and here. Jessica currently works as the Instruction & Research Specialist for the Sciences in the Center for Digital Liberal Arts at Occidental College. She also teaches General Biology at Pasadena City College. Melissa Blundell earned her Master’s Degree in the Animal Behavior Graduate Group in 2012. Melissa was funded by an NSF Graduate Research Fellowship. She investigated fighting and aggressive behaviors in sage-grouse and the role of laterality in sexual selection. Melissa is now a consultant with Dudek Environmental & Engineering. Teresa completed her PhD in 2012 in the Patricelli Lab through the Animal Behavior Graduate Group. 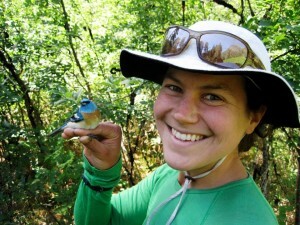 Her dissertation research was the first to experimentally investigate cacophonous aggregations in response to dead conspecifics and heterospecifics in the western scrub jay. She examined the function and physiology of cacophonous aggregations by testing the effects of seeing dead conspecifics, predators, and hearing conspecific alarm calls on foraging behavior, plasma corticosterone, and immediate early gene activity in specific areas of the brain. 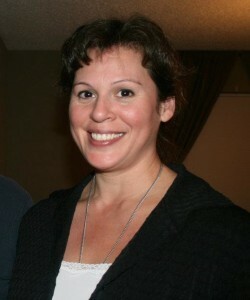 Teresa’s studies were funded in part by a fellowship from the Gates Foundation. 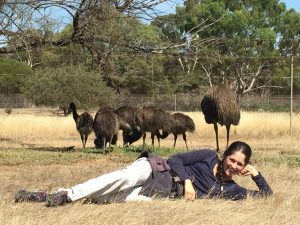 Since graduation, Teresa has continued this work in Australian birds; other areas of current research include broad patterns of brain evolution in fishes, and sleep behavior and physiology in cephalopods. After a few years at Macquarie University in Sydney, Australia, Teresa is currently a postdoc at the Okinawa Institute of Science and Technology (OIST) in Japan. Alli completed her PhD in 2018 in the Patricelli Lab through the Animal Behavior Graduate Group. Alli received her bachelor’s degree in Biology at Ursinus College (Collegeville, PA) in 2010 and her master’s degree in Ecology and Evolutionary Biology at the University of Michigan in 2013. At the University of Michigan, she worked with Dr. Elizabeth Tibbetts on animal behavior and communication, specifically studying intraspecific variation in individual face recognition in Polistes fuscatus paper wasps. Alli joined the Patricelli lab in the Fall of 2013, where she studied the effects of anthropogenic noise on behavior in tree swallows (Tachycineta bicolor). Specifically, Alli used experimental playbacks of traffic noise to study potential alterations in parental behavior and their impacts on parent and offspring quality in areas of increased noise. During her time in the Patricelli Lab, Alli was awarded the UC Davis Outstanding Graduate Student Teacher Award, the College of Biological Sciences Dean’s Mentorship Award for Undergraduate Research, a Professors for the Future (PFTF) fellowship, and a fellowship from the ARCS Foundation (2016, 2017). Alli is beginning a Rose Postdoctoral Fellowship at the Cornell Lab of Ornithology in Fall 2018. Anna completed her PhD in 2017 in the Patricelli Lab through the Animal Behavior Graduate Group. Anna’s dissertation research examined social influences on male breeding displays in greater sage-grouse, thus the degree to which males adjust their strutting behavior in response to market forces—including the number and quality of competing males, the number and quality of females, and the time in the breeding season. To do so, Anna designed a series of field experiments to measure male response to manipulation of the male social stimulus with playback of recorded male strut vocalizations and to manipulation of the female social stimulus with robotic females. To analyze the data from these experiments, Anna and collaborators developed a novel application of a powerful statistical technique to examine male display behaviors using a hidden Markov models (HMM). Anna’s research was funded in part by an NSF Graduate Research Fellowship. In 2016, Anna was awarded the UC Davis College of Biological Sciences Dean’s Mentorship Award for Undergraduate Research for her excellent mentorship of 42(!) undergraduates during her time in the Patricelli Lab. Anna also received a Professors for the Future (PFTF) fellowship. Jennifer completed her PhD in the Patricelli Lab in 2015 through the Animal Behavior Graduate Group. Jennifer is interested in the role of biological and climatic variation in shaping plumage coloration in birds. Specifically she studies Gloger’s Rule—the pattern of organisms being darker in areas of higher humidity—a widely followed but poorly understood pattern. Jennifer’s dissertation addressed why this rule exists by examining patterns of geographic variation at multiple levels from the individual to multi-family phylogenies. She examined these questions using specimens from museums across the country. 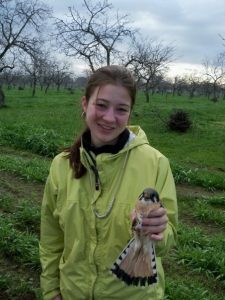 Jennifer’s previous research has addressed diverse topics on captive and wild populations of animals, including the impacts of human disturbance on bluebirds, fluctuating asymmetry in salamanders, plumage variation in terns, and behavioral endocrinology of dark-eyed juncos. Jennifer’s research was funded in part by a fellowship from the ARCS Foundation (2013-2014). Jennifer is now working for the Environmental Protection Agency. McGlothlin, J.W., Jawor, J.M., Greives, T.J., Casto, J.M., Phillips, J.L. & Ketterson, E.D. (2008). Hormones and honest signals: males with larger ornaments elevate testosterone more when challenged. Journal of Evolutionary Biology, 21, 39-48. Conor completed his PhD in the Patricelli lab in 2013 through the Animal Behavior Graduate Group. 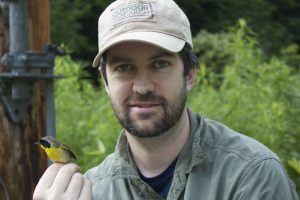 For his dissertation, Conor studied the evolution and function of multi-modal sexual signals in Common Yellowthroat warblers. His main questions dealt with 1) the function of complex signals in mate choice and how sexual selection changes in heterogeneous social and ecological environments and 2) the physiological basis of signal production and how physiological constraints can enforce honesty in sexual signals. During his time as a grad student at UC Davis, Conor was awarded the NSF Graduate Research Fellowship, an NSF Doctoral Dissertation Improvement Grant, a UCD Dissertation Year Fellowship, the UCD Merton-Love Award for Outstanding Dissertation in Evolution or Ecology, the Cooper Ornithological Society Young Professional’s Award, the A. Brazier Howell Award for Best student talk at the North American Ornithological Conference, and the Allee Award from the Animal Behavior Society. Conor started working on urban crows in Davis in 2012 and, after finishing his PhD, officially joined the Townsend lab at UC Davis for a USDA NIFA Postdoctoral Fellowship. Conor’s postdoc focused on studying the ecology and epidemiology of Campylobacter jejuni in wild crows and the possibility of transmission from wild birds to domestic animals and, ultimately, humans. He is now a postdoctoral fellow at the Cornell Lab of Ornithology working with Professor Maren Vitousek. Jessica completed her Ph.D. in the Patricelli Lab in 2012 through the Animal Behavior Graduate Group. Her dissertation examined the auditory and visual mechanisms of animal communication. 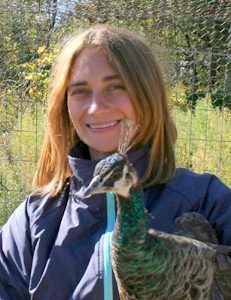 Using peafowl as a model system, she explored the role that attention plays in sexual selection and antipredator behavior. Jessica’s innovative and ground-breaking research involved developing an eye-tracker to use on peahens as they assess peacocks during mate choice — you can read more about it in National Geographic, and Slate, and Scientific American, and Live Science, and Futurity and more. Jessica’s research was funded in part by an NSF Graduate Research Fellowship and a National Geographic Explorer’s Grant. She continues to investigate the relationship between attention and behavior across different species. Jessica was a postdoc at Duke University and Purdue University after leaving UC Davis. Jessica is now an assistant professor in Department of Wildlife and Fisheries Sciences at Texas A&M University.